Clot formation is a physiological mechanism preventing bleeding at sites where there is loss of vascular integrity. This involves activation of the coagulation cascade and of platelets, eventually leading to an occlusive clot under pathological conditions.1 Accordingly, drugs have been developed to interfere with the activation of both these processes. As several coagulation factors such as factor VII, VIIII, X and thrombin (factor II) are vitamin K-dependent, drugs interfering with the effects of the vitamin (VKAs), i.e. warfarin and acenocoumarol, have been used for decades to prevent thromboembolism and embolic stroke.1 With the advent of selective inhibitors of factor X (apixaban, edoxaban and rivaroxaban) or factor II (dabigratan) the therapeutic spectrum of anti-thrombotic therapy has been expanded. A recent research article published in Eur J Prev Cardiol, led by Professor M. Lettino, Humanitas Research Hospital, Rozzano, Italy, provides an updated review of the current standards on antithrombotic therapy specifically addressed towards secondary prevention of ischemic heart disease.2 The article reflects the most relevant changes of current guidelines, as well as landmark trials in the field. Firstly, the authors examined the role of single antiplatelet therapy in the long-term management of ischemic heart disease. Aspirin is still the treatment of choice both in the stable phase and after acute coronary syndrome (ACS), however the authors highlight the potential harm of withdrawing this treatment in coronary symptomatic patients. The standard of treatment in double antiplatelet therapy after percutaneous coronary intervention in different clinical scenarios – stable coronary artery disease, acute coronary syndromes – was also reviewed (see Table 1). First, the use of vorapaxar, an oral inhibitor of the protease-activated-receptor. It has been approved for secondary prevention in patients with a history of myocardial infarction or peripheral artery disease by both FDA and EMA. However, current guidelines do not consider this a routine recommendation in the absence of trials contemplating contemporary DAPT schemes with this agent. Conversely the clinical development of rivaroxaban in the setting of coronary artery disease is gradually expanding. This oral factor Xa inhibitor has been tested as an adjunctive therapy in patients in the ATLAS ACS 2-TIMI 51 trial.4 Here, rivaroxaban 2.5 mg twice daily in addition to aspirin significantly reduced the primary end point of cardiovascular death, myocardial infarction, or stroke compared with placebo. There was an increase in major bleeding, without significant increase coronary artery bypass related bleedings. Finally, Lettino et al address the combination of antiplatelet treatment with oral anticoagulation. Triple antithrombotic therapy has been the subject of extensive investigation. The standard of treatment exposed by the authors references the 2016 ESC guidelines for the management of atrial fibrillation.7 According to this framework, oral anticoagulation added to DAPT after percutaneous coronary intervention should be preferably with vitamin K antagonists. 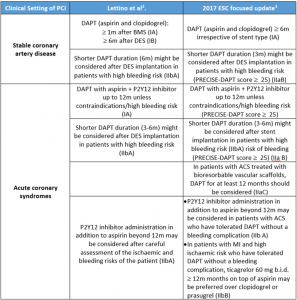 The option of combining a novel oral anticoagulant with DAPT is contemplated in this guideline7 and in its updated version,8 but the dose recommendation is not clear. The latter defends using the lower-tested and licensed dose for stroke prevention in atrial fibrillation: dabigatran 110 mg twice daily, rivaroxaban 15 mg once daily, apixaban 2.5 mg twice daily, or edoxaban 30 mg once daily. This would support the design of PIONEER AF-PCI trial,9 which investigated the safety of anticoagulation with rivaroxaban at two different doses (15mg once daily and 2.5mg twice daily) plus one or two antiplatelet agents in patients undergoing percutaneous coronary intervention. Additionally, the RE-DUAL PCI trial,10 the results of which were announced at the recent ESC 2017 Congress found that dual therapy with dabigatran and a P2Y12 antagonist significantly reduced the risk of bleeding versus warfarin triple therapy, with non-inferiority for overall thromboembolic events. These dabigatran dual therapy regimens, using doses approved worldwide for stroke prevention (110mg and 150mg twice daily), offer clinicians two additional options for managing atrial fibrillation patients after percutaneous coronary intervention. 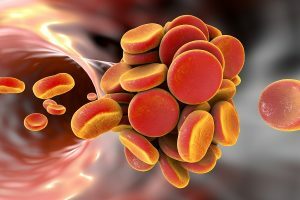 As the availability of more effective antiplatelet and antiocoagulant agents increases, the existing and long-standing paradigm supporting antithrombotic treatments in different and combined clinical situations will continue to be revisited. Ongoing trials will provide new evidence on treatment options in the search for an optimal balance between bleeding and ischemic events. 1.- Lopes RD, Rao M, Simon DN, Thomas L, et al. Triple vs Dual Antithrombotic Therapy in Patients with Atrial Fibrillation and Coronary Artery Disease. Am J Med. 2016;129(6):592-599.e1. 2.- Lettino M, Leonardi S, De Maria E, Halvorsen S. Antiplatelet and antithrombotic treatment for secondary prevention in ischaemic heart disease. Eur J Prev Cardiol. 2017;24(3_suppl):61-70. 4.- Mega JL, Braunwald E, Wiviott SD. Rivaroxaban in patients with a recent acute coronary syndrome. N Engl J Med 2012; 366: 9–19. 7.- Kirchhof P, Benussi S, Kotecha D. 2016 ESC Guidelines for the management of atrial fibrillation developed in collaboration with EACTS. Eur Heart J 2016; 37: 2893–2962. 8.- Heidbuchel H, Verhamme P, Alings M, et al. Updated European Heart Rhythm Association practical guide on the use of non-vitamin-K antagonist anticoagulants in patients with non-valvular atrial fibrillation: Executive summary. Eur Heart J. 2016. [Epub ahead of print] Review.